Use Our Secure Shopping Cart, accepting payments by Visa, MasterCard, Amex and PayPal Services or Google Checkout. S 2-4 25"-28" 35"-37" 32"-34"
M 6-8 27"-30" 37"-39" 34"-36"
L 10-12 29"-32" 39"-41" 36"-38"
XL 14-16 31"-34" 41"-43" 38"-40"
Copyright © 1997 - 2007 Van de Sande Industries, Inc.
Cosmopolitan - The Cosmo is one of the most asked for drinks of the last decade, hence the popularity of this shirt. 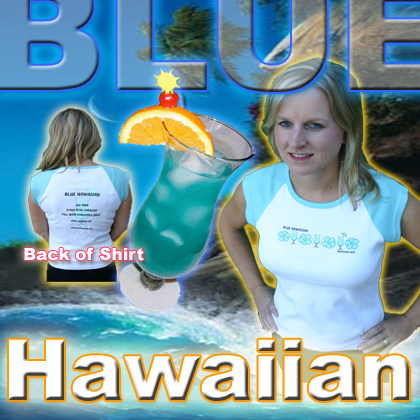 Show off your colors with our Cocktail Apparel. Get yours Today, and start making this cocktail as Professional Bartenders. Show off your colors with our Cocktail Flair Practice Bottles. Unbreakable Construction, 750 ml size bottle pour spout included. Get yours Today, used by Professional Bartenders who get their FLAIR on, become Fast and Reliable while entertaining guests. Get the party started with this cocktail, no girl could resist. Put on some color with our Cocktail Apparel. Get yours Today, used by Professional Bartenders who get their FLAIR on, become Fast and Reliable while entertaining guests.. The color of this cocktail alone will take you to Paradise. Wait... did somebody says SHOTS!!! Everyone loves this smooth nip. Get the party started with this cocktail, no one can resist getting Dirty. 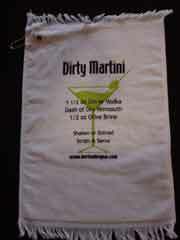 Dirty Martini Logo on the Front, blank backside. 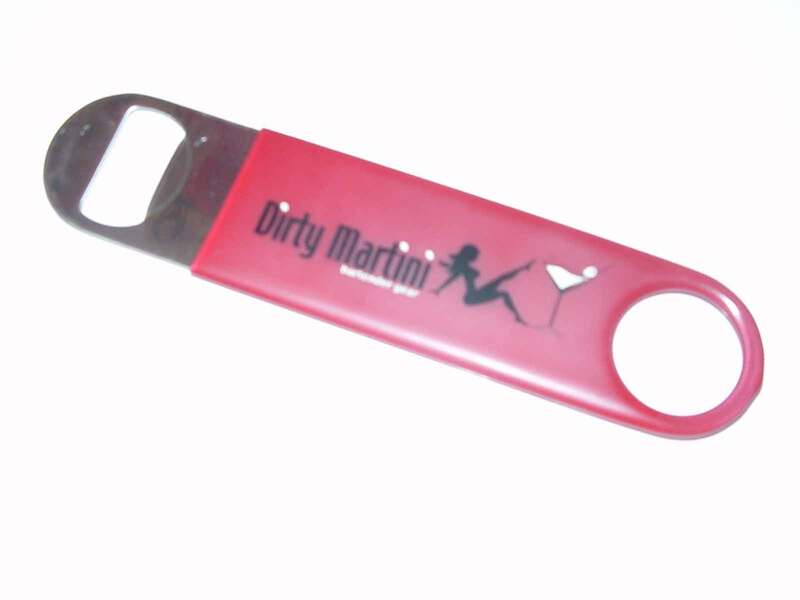 The bartender's professional paddle style, heavy gauge stainless steel bottle opener cranberry vinyl coated. A must for every bartender at home or on the job. Opening bottles faster means extra money in your tip jar, nightly. Get yours Today, Dimensions: 7" by 1 5/8"
Pucker up with this cocktail, sweet sugar baby. 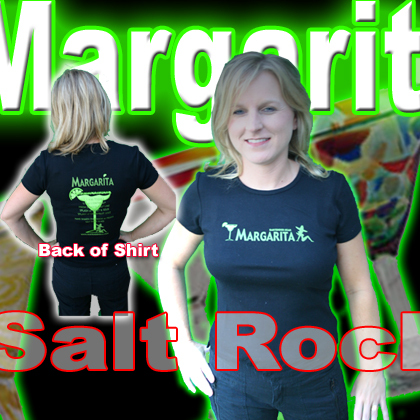 Get some color with our Cocktail Apparel. your party will be in full swing in no time. The bartender's professional paddle style, heavy 14 gauge stainless steel bottle opener black vinyl coated. A must for every bartender at home or on the job. There is no turning back once you've gone RED. Put some color on with our Cocktail Apparel. 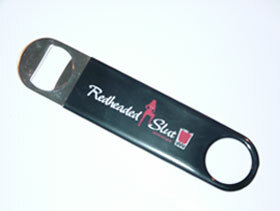 The bartender's professional paddle style, heavy 14 gauge stainless steel bottle opener black vinyl coating. A must for every bartender at home or on the job. 'Slippery When Wet' sipping the Nip, we'll even make it Buttery. The Cosmo is one of the most asked for drinks of the last decade. Show off your colors with our Cocktail Decals. Get yours Today, dimensions: 3" by 6"
Put on some color with our Cocktail Decals. Get yours Today, dimensions: 3" by 6". Tight Fitting 2X Ribbed Tank Top . Show off your colors with our Cocktail Bar Towels. Get yours Today, dimensions: 16" by 26" Tri-Fold with grommet & closing-hook. Clean Sweep with this Smooth Nip. Put on some color with our Cocktail Bar Towels. Clean Sweep with this Smooth Nip . Wipe up the Pucker from this Sweet Drink. Easy clean-up while Getting Dirty. Get yours Today, dimensions: 15" by 11" with grommet & closing-hook. Wishing you were in Baja... Me Too! Wipe-up the overflow & drips. Hit the Beach Bar with this one.